Sinatra Suite by Julie Kent and Sascha Radetsky. Music by Frank Sinatra, choreography by Twyla Tharp. 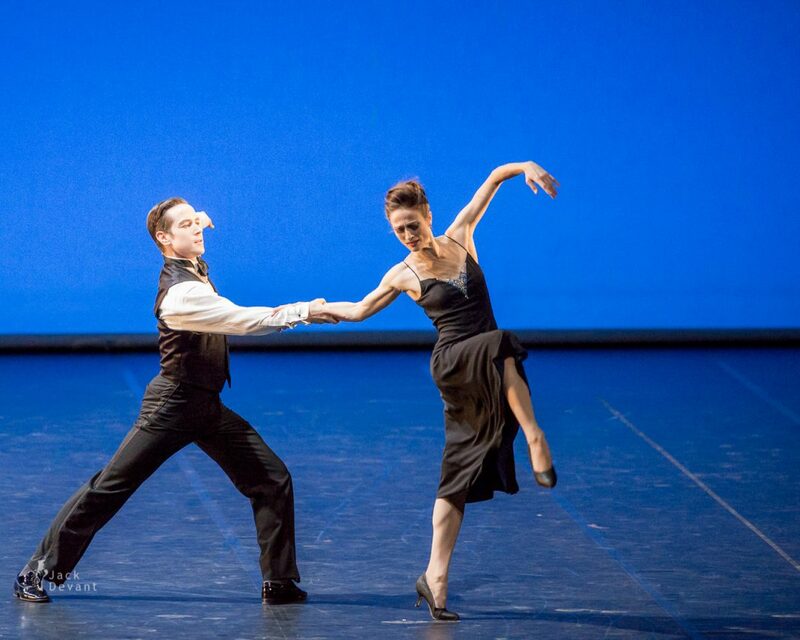 Taken on 20.1.2014, at Deutsche Oper Berlin, Malakhov and Friends — The Final ballet gala. Julie Kent is an American ballet dancer; she currently performs as a principal dancer with the American Ballet Theatre. She was born on 1969, given name Julie Cox in Bethesda, Maryland, to an American father and a mother from New Zealand who was a flight attendant and a former ballet dancer. Her early dance training took place under Hortensia Fonseca at the Academy of the Maryland Youth Ballet. She also studied at the American Ballet Theatre II summer school and the School of American Ballet. She took the stage name Julie Kent at the suggestion of Mikhail Baryshnikov. Kent joined American Ballet Theatre as an apprentice in 1985, became a member of the company’s corps de ballet in 1986, was promoted to soloist in 1990, and to principal dancer in 1993. Sascha Radetsky is a soloist danseur with the American Ballet Theatre and an actor. He was born on 1977 in Santa Cruz, California, and began studying ballet in the San Francisco Bay Area. He was invited to study at the Bolshoi Academy in Moscow when he was 15 and after spending a year there, he went to The Kirov Academy of Ballet. He later studied on a scholarship in the summer programs of the School of American Ballet, the American Ballet Theatre’s School of Classical Ballet with Mikhail Baryshnikov and the San Francisco Ballet School. Radetsky joined the American Ballet Theatre as an apprentice in 1995, moving up to corps de ballet the following year and named a soloist in 2003. In September 2008, Radetsky joined the Dutch National Ballet as a principal dancer. In September 2008, Sascha Radetsky left ABT to join Dutch National Ballet as a principal dancer. On January 1, 2010, Radetsky returned to American Ballet Theater as a Soloist. Twyla Tharp (born 1941) is an American dancer and choreographer, who lives and works in New York City. She attended Pacific High School in San Bernardino and studied at the Vera Lynn School of Dance. Tharp attended Pomona College in California but later transferred to Barnard College in New York City, where she graduated with a degree in Art History in 1963. It was in New York that she studied with Richard Thomas, Martha Graham and Merce Cunningham. In 1963 Tharp joined the Paul Taylor Dance Company. In 1965, Tharp choreographed her first dance Tank Dive. In 1966, she formed her own company Twyla Tharp Dance. Her work often utilizes classical music, jazz, and contemporary pop music. From 1971 to 1988, Twyla Tharp Dance toured extensively around the world, performing original works. In 1973, Tharp choreographed Deuce Coupe to the music of The Beach Boys for the Joffrey Ballet. Deuce Coupe is considered to be the first crossover ballet. Later she choreographed Push Comes to Shove (1976), which featured Mikhail Baryshnikov and is now thought to be the best example of the crossover ballet. In 1980, Tharp’s work first appeared on Broadway with Twyla Tharp Dance performing When We Were Very Young, followed in 1981 by The Catherine Wheel, her collaboration with David Byrne at the Winter Garden. “Wheel” was broadcast on PBS, and had its soundtrack released on LP. In 1985, her staging of Singin’ in the Rain, played at the Gershwin for 367 performances. In 1988, Twyla Tharp Dance merged with American Ballet Theatre, since which time ABT has held the world premieres of 16 of Tharp’s works. In 2010, they had a total of 20 of her works in their repertory. Tharp has since choreographed dances for: Paris Opera Ballet, The Royal Ballet, New York City Ballet, Boston Ballet, Joffrey Ballet, Pacific Northwest Ballet, Miami City Ballet, American Ballet Theatre, Hubbard Street Dance and Martha Graham Dance Company. Tharp also created the dance roadshow Cutting Up, (1991) with Mikhail Baryshnikov, which went on to tour and appeared in 28 cities over two months. Tharp premiered her dance musical Movin’ Out, set to the music and lyrics of Billy Joel in Chicago in 2001. The show opened on Broadway in 2002. Movin’ Out ran for 1,331 performances on Broadway. A national tour opened in January 2004. Movin’ Out received 10 Tony nominations and Tharp was named Best Choreographer. Tharp opened a new show titled The Times They Are a-Changin’, to the music of Bob Dylan in 2005 at The Old Globe Theatre in San Diego. The Times They are A-Changin’ set the records or the highest grossing show and highest ticket sales as of the date of closing (March 2006). It was also the first time a show received a second extension before the first preview. After this record setting run in California, the New York show ran for 35 previews and 28 performances. In 2009, Tharp worked with the songs of Frank Sinatra to mount Come Fly with Me, which ran at the Alliance Theater in Atlanta and was the best selling four-week run as of the date of closing in 2009. Renamed Come Fly Away the show opened on Broadway in 2010 at the Marquis Theatre in New York and ran for 26 previews and 188 performances. Come Fly Away, was retooled and opened under the title Sinatra: Dance with Me at The Wynn Las Vegas in 2011. Come Fly Away National Tour opened in Atlanta, Georgia, in August 2011. One Response to "Sinatra Suite by Julie Kent and Sascha Radetsky"
Great photographs Jack. I love Twyla Tharp’s works a lot. Julie Kent has a beautiful appearance and posture, you got her in your photographs in a very beautiful way!